One hundred and eleven years ago today Fred Gaisberg was in the middle of his third big recording expedition. He’d travelled to continental Europe over the summer of 1899 and the British Isles over the autumn of that year and had already made hundreds of the world’s first recordings. In spring 1900 he and his colleague William Sinkler Darby travelled to Russia to make some more recordings of local artists. You can see them posing in newly purchased fur coats which were necessary to ward off the effects of the savage cold weather they encountered. 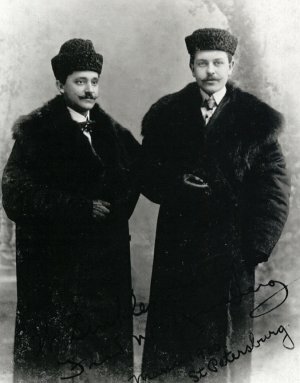 Gaisberg is on the left. It sounds like quite a party…. This entry was posted in 1900, HISTORY OF RECORDED MUSIC, PEOPLE, recording legends and tagged 1899, 1900, fred gaisber, russia, st petersburg, william sinkler darby by Nipper. Bookmark the permalink.